For nearly 100 years, itinerant workers known as “wheaties” have followed the Great Plains wheat trail, cutting ripening grain from south to north. Climate change, global markets, and the depopulation of rural America are now casting doubt on the future of their way of life. Myron Eberts stood on the platform of his red Case IH combine with a matching red t-shirt—the only color shirt he ever wears— blue jeans, scruffy gray beard, and his baseball hat adorned with the logo for his company: Eberts Harvesting. With his phone’s remote headset around his neck, he stared down toward the ground on the edge of the 300 acre field, mired in thought. For the second morning in a row, the wheat on the outskirts of Martin, South Dakota was too wet to cut. 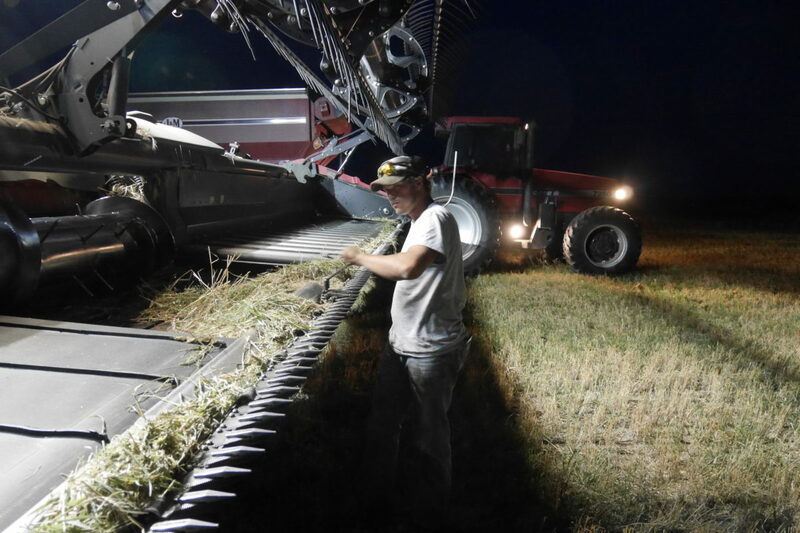 Cole, a 17-year-old from eastern Montana Eberts had hired for the summer, sat in the wheel well of the combine staring at his phone as Eberts ran dozens of different scenarios through his head for what must have felt like the hundredth time. It was late July, and Eberts’s six-person crew was growing anxious. They had been in Western South Dakota for a couple weeks. A recent stretch of rain had delayed their progress, and the wheat at their next job would be ready to cut any day. 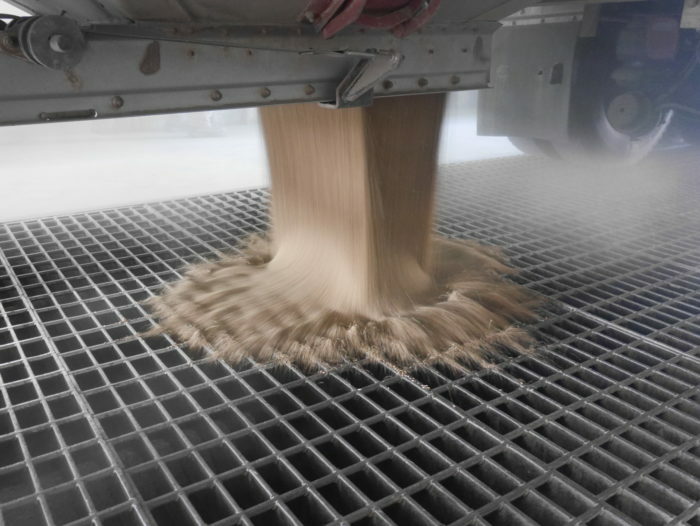 Wheat, like all commodity crops, must be harvested at just the right moisture level—not too dry that it loses nutrition, and not too wet that it can’t be stored for many months in a silo or grain elevator. For the third time that morning, Eberts called another young crew member, Jared, to cut a few test rows to check the moisture levels. Jared jumped into an identical combine, steering the forty-foot header over a few rows of golden spring wheat. At the right conditions with their two combines running at full tilt, they could cut 60 acres per hour, but the combine’s computer read 16-18 percent moisture—still too high for the grain elevators, which begin to dock the price when the moisture measures above 13.5 percent. They’d be waiting for at least a few hours more before the fields dried sufficiently. Eberts has followed the annual wheat harvest, starting the spring in Oklahoma and ending each fall in North Dakota, for nearly 40 years. Even with ripe wheat waiting, the entire crew was stuck in Martin with at least two more days of cutting in front of them. And with overcast skies looming above, they were, once again, at a standstill. These kind of unpredictable conditions set wheat harvesters—a subculture that’s invisible to everyone outside the Great Plains—apart. “You need to have a little bit of guts,” to do the job, says Eberts. For nearly 100 years, these itinerant workers known as custom harvesters, custom cutters—or “wheaties”—have followed the wheat trail from the Texas panhandle to North Dakota and Montana, cutting ripening grain as they slowly move north from spring into fall. 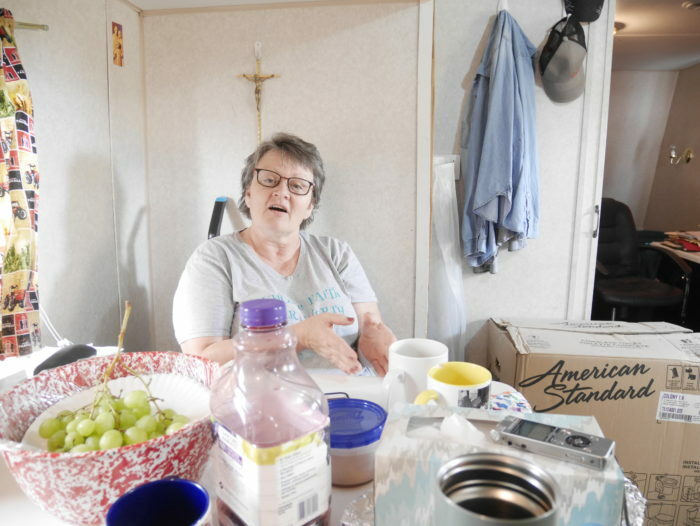 Living out of trailers on the outskirts of small towns in seasonal harvest camps, wheaties—once a derogatory term, now a badge of honor—were derided for most of their existence as gypsies and were forced to carry all the other stigmas that follow nomadic workers. 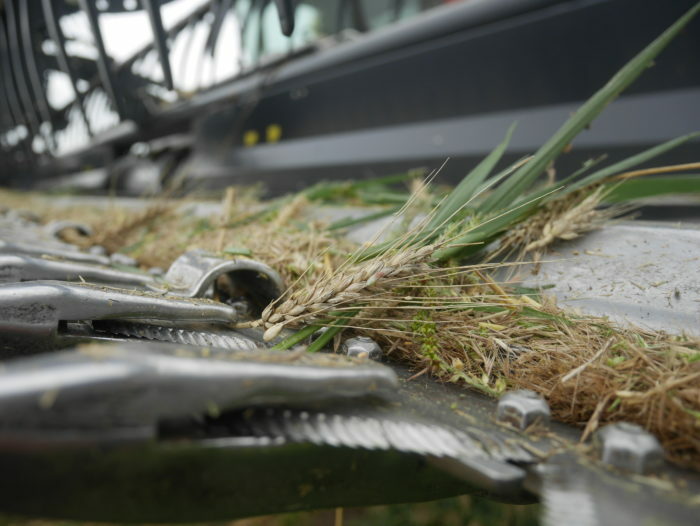 Even so, custom harvesting has been integral to Great Plains agriculture. Myron Ebert with a sample of wheat to be tested for its moisture content. Today, the harvest industry’s long-term prospects are in doubt. While there is no official tally, it’s clear that fewer custom harvester crews are following the trail compared to 40 years ago. Many harvesters are hanging on, but new crews are having a hard time at it. One couple recently left the business after just two years on the trail. Climatic changes, increasing competition from global markets, changes in cropland, increasing overhead costs, deficient government policies, and the depopulation of rural America have coalesced to cast doubt on the future of custom cutting. Taken together, the new suite of challenges harvesters face embodies the larger struggle of middle America and offers a lens into understanding how and why this region has been left behind. The first horse and mule-drawn combine harvesters were developed in the 1800s, but custom harvesting didn’t take off until World War I, when the price of wheat helped justify the machine’s expense, and the diminished labor force created a need for more efficient harvesting methods. Farmers started taking their new combines on the road to cut for neighbors as a way of defraying the cost of the equipment. By the 1920s, harvesting had become profitable enough on its own that non-farmers started to purchase combines with the sole intention of custom cutting. The labor shortage created by World War II further cemented custom harvesting’s place in Great Plains agriculture. But, more than anything, the nomadic lifestyle was made possible because starting in the spring, wheat ripens 100 miles further north each week. This reliable timetable made it possible for harvesters to follow maturing grain north throughout the summer, running their equipment for as many as 6 months out of the year. Fast-forward to today, however, and the consistency that had been the industry’s lifeblood has unraveled due to the effects of climate change that have dismantled this orderly rhythm. 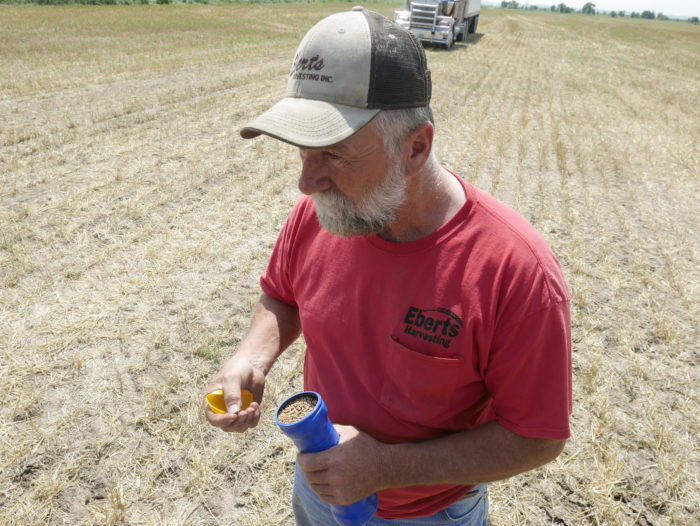 This year, several farmers’ crops that Eberts typically cuts had ripened at once, forcing him to give one of the jobs to another harvester with the hope that he’d be back again the following year. Along with ripening schedules becoming unpredictable, extreme weather events like hail, tornadoes and late freezes that can wipe out a crop have become increasingly common. An early July hailstorm in Oneida, South Dakota this year came close to completely decimating the region’s crop. In instances like this, harvesters are often left scrambling to find another job at the last minute. Drought has also proved devastating. For the past few years, persistent drought hurt crop yields in the northern plains, with 2017 marking a low point. Despite a good winter with heavy snows, precipitation failed to come in the spring, and by summer, Eastern Montana, Western South Dakota and nearly all of North Dakota faced extreme drought. The nation’s largest wildfire of 2017 didn’t occur in an alpine forest, but on the plains of Eastern Montana, where the Lodgepole Complex Fire burned more than 270,000 acres, including cropland, many farmers in the region didn’t get any crop off, which meant no work for harvesters. Moisture returned to the northern plains in 2018, but then farmers in the southern plains experienced similar drought. In Texas and Oklahoma, the yields were low enough that many harvesters had to skip their first jobs. The Eberts’ first job is usually in southwestern Oklahoma near the town of Frederick, which is still one of the largest, most dependable areas for wheat and often serves as the kickoff for the harvest season. But this year, there was no crop to harvest, so their season, along with that of many other harvesters, started a couple weeks later and few hundred miles further north. While lost acres can always affect a harvester’s bottom line, other shifts in large-scale agriculture have made those acres increasingly difficult to replace. Tracy Zeorian is a third-generation harvester from eastern Nebraska who has served as president and executive director for U.S Custom Harvesters, Inc. and now leads HarvestHER, an initiative designed to celebrate the role that women have long played in custom harvesting. She followed the wheat trail for the first time in 1972 on her grandparents’ crew. At that time, she remembers western Kansas as being “wall-to-wall wheat.” Now, she says, it’s all corn. 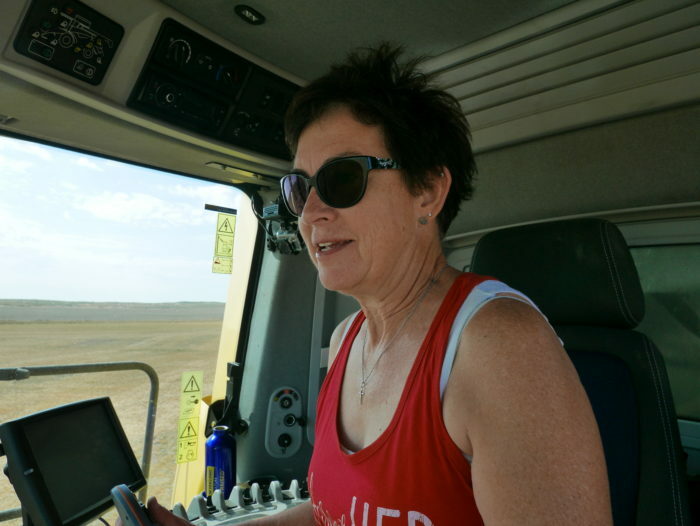 Tracy Zeorian driving a combine outside Jordan, Montana. Myron Eberts has noticed the same trend. On his own farm, he began in the 1970s by growing wheat, exclusively. But as ethanol plants popped up across the Midwest, corn prices have become too good to pass up. The move toward corn and soy, which typically require substantial amounts of water, has only recently been made possible due to the development of hybridized and genetically modified drought-tolerant seeds. “They’ve changed the dynamics of the crops,” says Zeorian. Every harvester’s operation is slightly different. The Eberts typically run two or three combines with the necessary hired crew to operate the tractor and grain cart and trucks that haul the wheat to nearby grain elevators. The Zeorians run a single combine with no hired crew, which allows them to cut about 30 acres an hour, so they often work alongside farmers who need extra help to get their crop off as quickly as possible to avoid any rain or other weather that could impact yields. This is part of the stress of the harvest. If hail, late freezes, tornadoes, or other extreme events destroy a farmer’s crop, they can apply for various forms of assistance—either through the government or private insurance. But harvesters simply lose time and money when things go awry. The Zeorians take some pride in the fact that living with risk—and juggling commitment and relationships—is part of who they are. “You’ve never seen a bunch of people who are so wanting to work, driving thousands of miles pinning up business cards and posters, hoping someone will see it and call,” says Jim. On top of all this, America’s wheat industry is now, more than ever, subject to global market forces. Australia, Russia, China, Brazil, and the European Union are producing a growing portion of the world’s grain, cutting into America’s share of the market and keeping the price of wheat low. This year, Australia, Europe, and Russia are all experiencing extreme drought leading to poor crops. 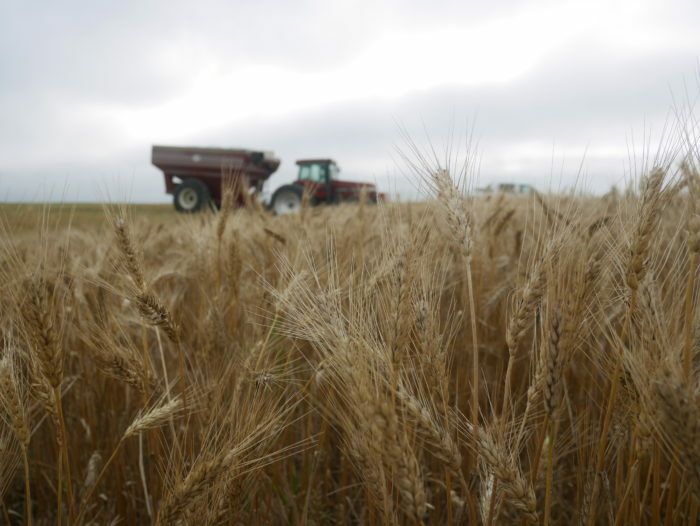 And, for the first time in six years, the world is headed toward a wheat deficit. This should be good for American growers and harvesters, but while wheat futures have skyrocketed at markets in Chicago, the effect has yet to reach the people on the ground. Today, wheat commands about $5.31 per bushel on the American market, which is identical to the price in 1974. Meanwhile, all other costs of doing business have increased exponentially. Myron recalls buying his first combine for less than $30,000, but today, the header–the interchangeable front of the combine that cuts the grain and funnels it toward the thresher–alone may cost $100,000, with a new combine commanding more than $500,000. One of the Eberts’ crew members, Cole, gassing up the tractor at the beginning of the day. She worries a day will come when Americans will no longer grow their own food, either because enough crop lands will have been developed and paved over or because large-scale agriculture will no longer be profitable on the family scale. “It’s important to me because I want my grandkids to know where their food comes from and to understand and respect nature,” she says. For Nancy, as well as the Zeorians, this consternation is very much tied to the larger trend of outmigration that has decimated rural America over the past decades, especially in Great Plains states. This has had both a direct and indirect effect on the custom harvest industry. “Even in our small little rural community, people don’t understand what we do,” says Tracy. Smaller rural populations have also made hiring crews more difficult. Many harvesting crews hire foreign workers under H-2A visas because they tend to be reliable. With their relatively small crew, Myron and Nancy have continued to hire American workers, but it is significantly more difficult. In the early days, they hired local farm kids, but as more and more families moved to cities, there have been fewer farm kids to fill these positions, and increasingly protective parents have become less and less likely to let their teenagers go out on the harvest. Harvesters have also noticed an increasing disinterest in this kind of work. The Eberts went 30 years without firing any crew members, but now, they say it’s common. There’s a greater chance crew members will just not show up and most are far more likely to leave before the end of the season. “If someone doesn’t like it, they’re gone,” says Nancy. “There’s not that stick-to-it-ness. According to Tom Isern, Distinguished Professor of History at North Dakota State University, both the cost of doing business and the increasing difficulty of recruiting workers will likely have a transformational impact on the industry. Even if more farmers purchase combines, the industry will never disappear completely. The work will still require skilled labor that harvesters can provide. The market aspect of this shift is still in its earliest stages, but the underlying cultural and social aspect have been underway for decades. According to Isern, the harvest used to depend on a “moral economy” whose basis was the loyalty engendered through interlocking family relationships between harvesters and farmers. 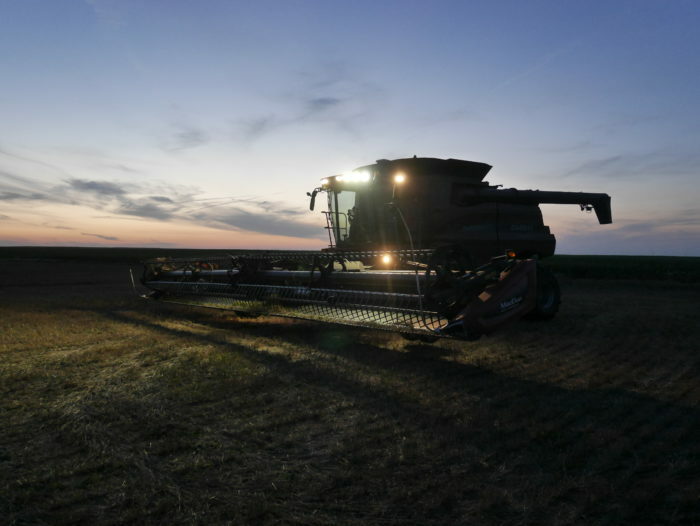 However, as harvesting has become more of an international industry, increasingly dependent on corporate forces, the difficulties facing the harvest have become a microcosm of the Great Plains as a whole. But she also realizes her years of living in a trailer on the outskirts small towns on the Great Plains, working well past dark, worrying about the weather and stressing about the next job are numbered. She holds no illusions about how difficult the industry has become, but for her, it’s much more than a business. That romanticism still exists, and like many harvesters, she dreads the thought of letting it go. If the conditions are good, most crews will run their combines until well past sunset. This story is part of a year-long series about the underreported agriculture stories in our rural communities. The reporting was made possible by an award from the Institute for Journalism and Natural Resources. All Photos by Michael Dax.